Chemistry. For some students a blessing, for some a nightmare. Chemistry lessons catch students' interests either completely or not at all. 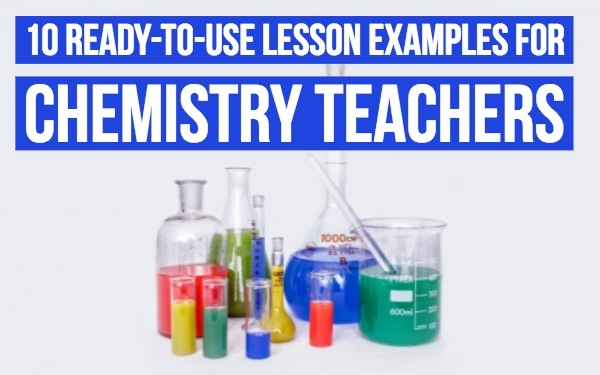 And since, unlike what students expect, you don’t do awesome chemistry experiments all the time, it’s important that you teach this subject well. Sure, there are experiments involved, but there’s much more to chemistry than only that. So, how on earth can you make the rest appealing to students as well? Let me show you. 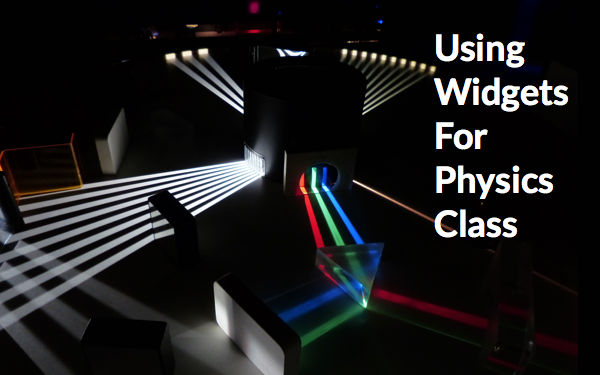 It’s all about the interactivity and visibility of the learning material. It’s all about your imagination. I created some chemistry lesson plans or material that you can use right away. 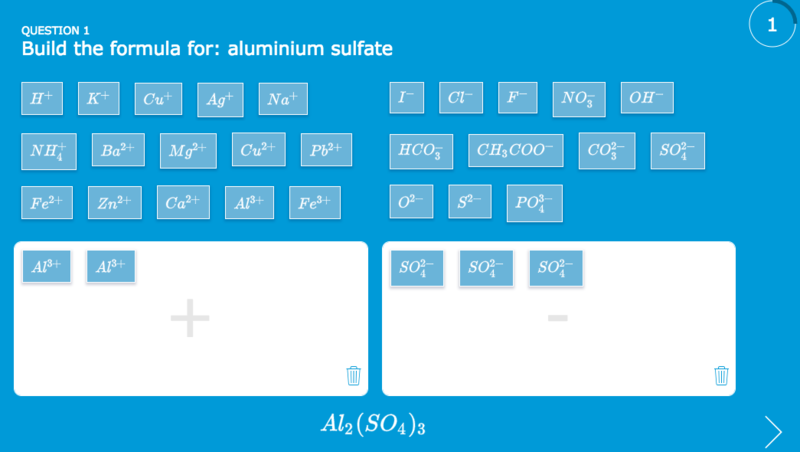 These are just basic chemistry lessons, but might give you the inspiration to create some more challenging chemistry exercises or widgets as well. 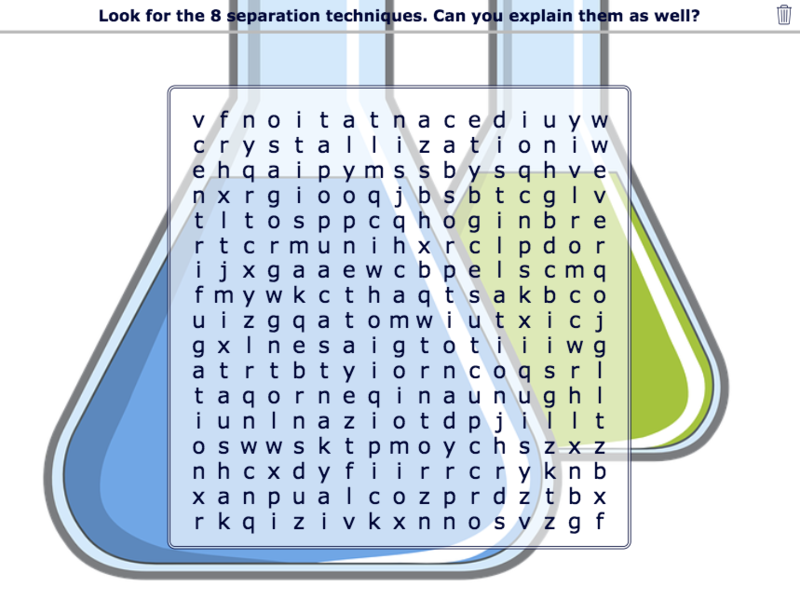 The exercises below include middle school chemistry lessons as well as high school chemistry lessons. All these exercises are made with BookWidgets. If you want to give it a try, just sign up and get started right away. You can also copy the widgets I created to your own BookWidgets account and adjust them if you want. In this first example, I used the BookWidgets randomness widget. I added all the danger symbols to the randomness template. You have to spin the wheel for each student and ask them what the symbol means. It’s a good exercise to see which student actually studied the symbols. It’s also fun for students, because they don’t really know what they are going to get. 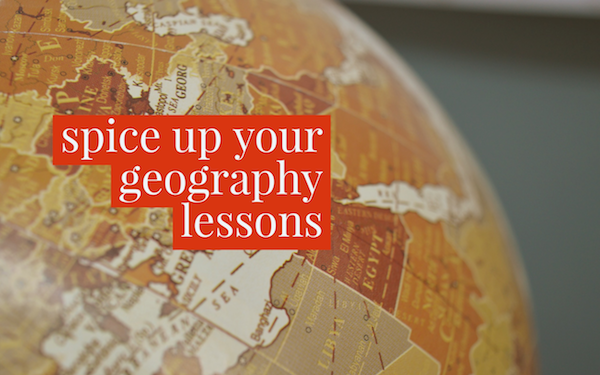 Believe me, you have your students' attention more than ever! Click on the image to open the exercise. When you think about chemistry, you think about the periodic table. 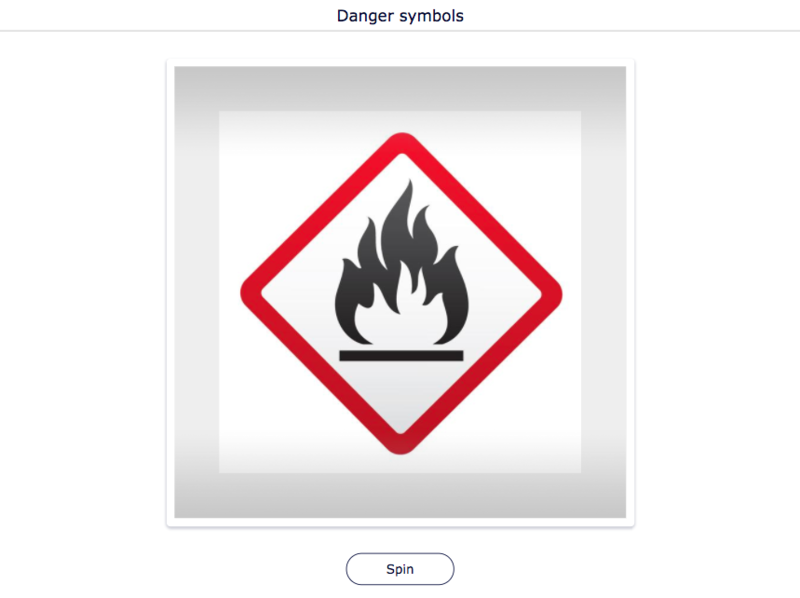 And of course, there are so much chemistry teaching resources about this topic. Just take a look at how you can be creative when teaching this subject. 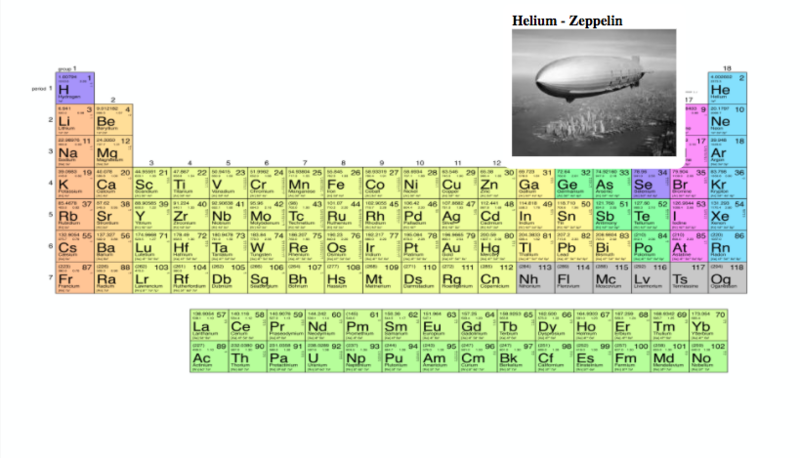 For this one below, I added different hotspots to an image of the periodic table. 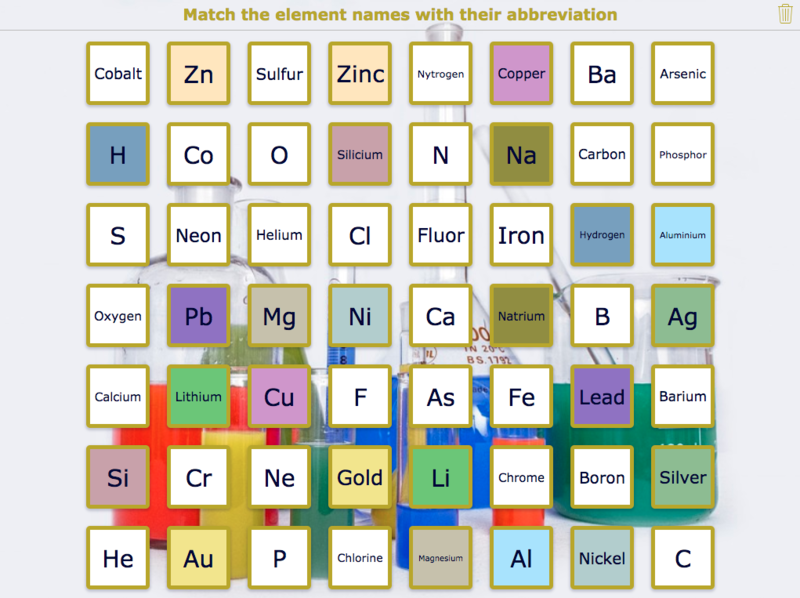 Now students can see better what those chemical elements really mean and what they represent. 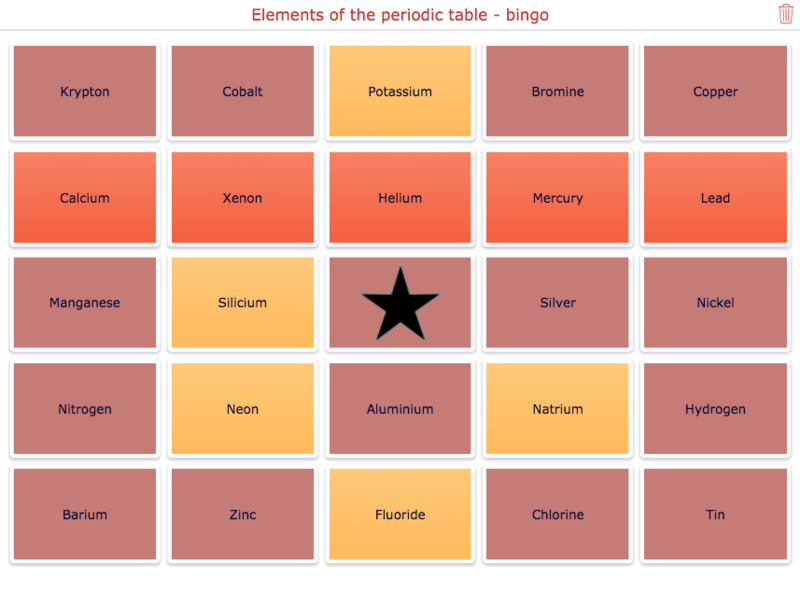 Click on the image to take a look, then click on the different elements in the periodic table. In this example I only represented the most known elements. 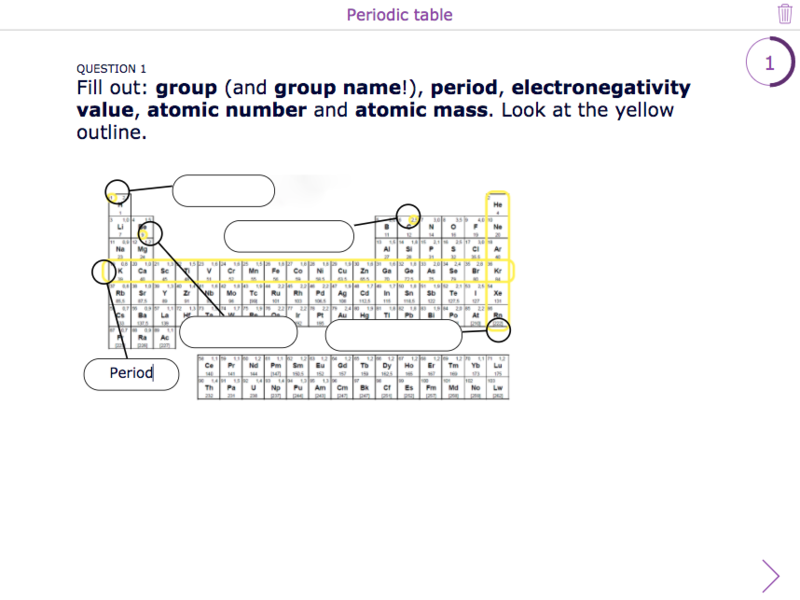 When you want your students to learn the complete periodic table by heart, you could use the Pair Matching widget. Let your students match the element names with their abbreviation. What a fun way to learn! Here, your students also have to learn the elements of the periodic table by heart. The only difference is the learning method. You, as a teacher, write the element abbreviations on the chalkboard, one by one. Students have to look for the complete element name on their bingo sheet and tick it off. When a student has ticked off 5 elements in a row, he has bingo! Every student will get a different bingo sheet. When assessing your students, you can use the quiz widget. Even when it comes to the periodic table. You don’t always need paper. The quiz widget has a lot of fun question types that makes it possible to stay digital. Do you know the answers of this example? Give it a try! In this example, students have learned the 8 separation techniques. Now, they have to be able to sum them all up and, more important, find them in the word search. You could give them the techniques to make it easier, but what’s the fun in that? After finding all the techniques you can ask your students to explain them. Are you able to find them all? The adaptable timeline widget makes it possible for students to add text and images. As a teacher, you insert some instructions to the different events for each phase of the experiment. Now, let your students follow the instructions and steps. They have to write down their findings and add picture op their experiment in each stage. Of course, students can submit the complete timeline at the end of the assignment. 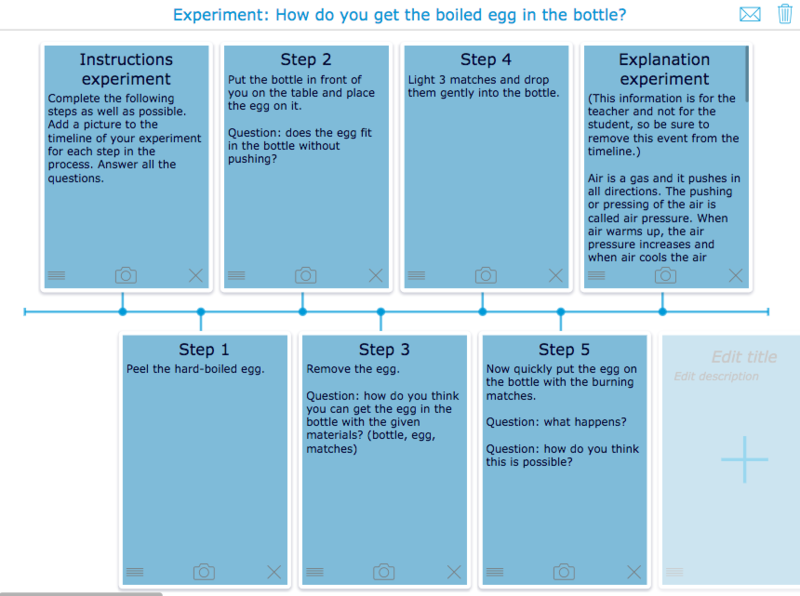 Take a look at these experiment instructions of the egg and the bottle. Of course you can also create a simple digital worksheet as well. Take a look at this example below. In this BookWidgets worksheet, you can choose between more than 20 different interactive question types. The photo question type is just perfect when doing experiments. 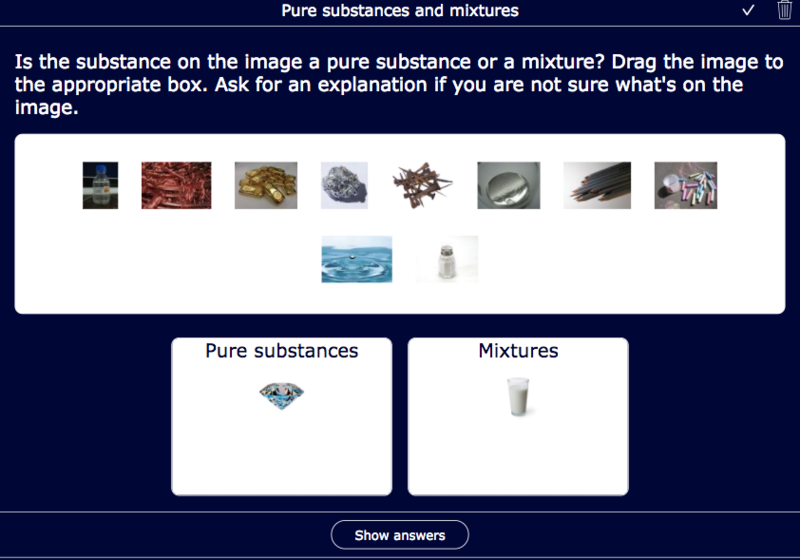 When teaching your students about pure substances and mixtures, the worksheet widget is the perfect match. In this example I used the “Picture drag & drop” question type. This makes learning about this subject more visual and interactive. Want to give it a try? Click on the image to open the example exercise. As I’ve said before, the quiz and worksheet offer an enormous choice of question types. 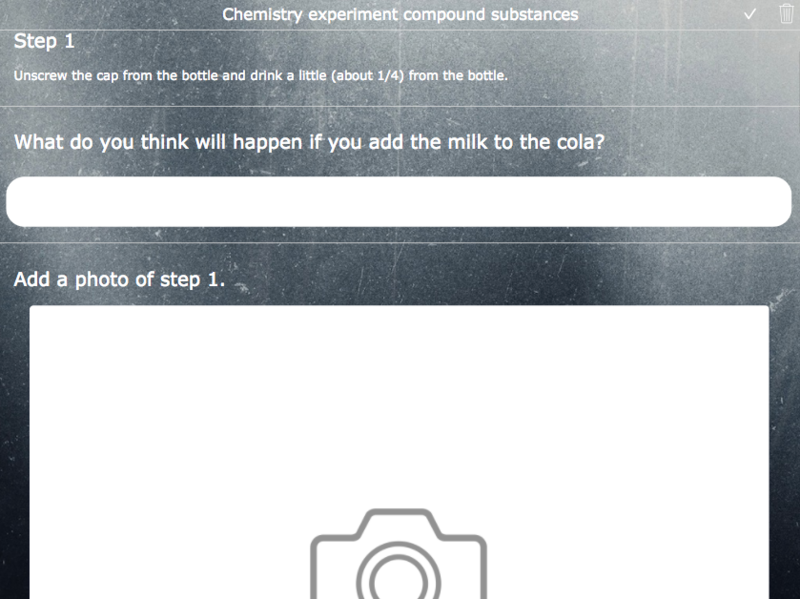 There are even two question types especially made for chemistry teachers! These question types teach students to build ionic compounds and to find out if given chemical equations are balanced or not. I bet you can’t find this question type anywhere else! So, we’re at the end of this post. 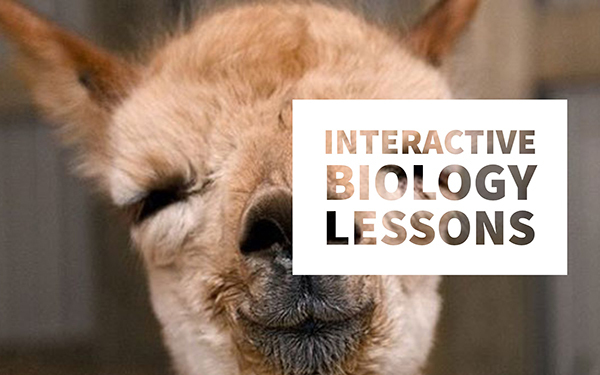 These chemistry lesson ideas are just the tip of the iceberg. With the right imagination and ideas, you can make any exercise you want. Join our Facebook BookWidgets user group and share your ideas with other teachers, ask for advice and get inspired by others.